Hi everyone! 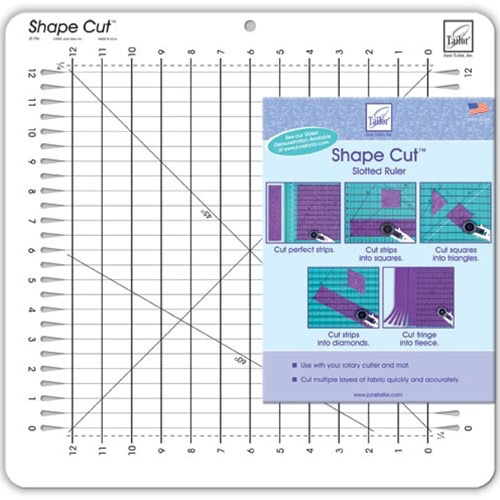 It’s Michele here for today’s Learning Center post on not so basic quilting tools. I asked several quilting friends to recommend their favourites and have give-aways for a few of them too. Karen from Sew Many Ways is also sharing a few of her most popular DIY tools. 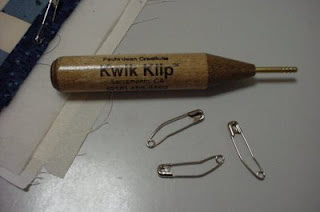 See also, last month’s post on Basic Quilting Tools. One of my most favourite tools is my June Tailor Shape Cut Ruler. I’ve had mine for a few years now and use it quite often. I have the 12″ ruler with 1/2″ increments, though I know they make other variations of it too. 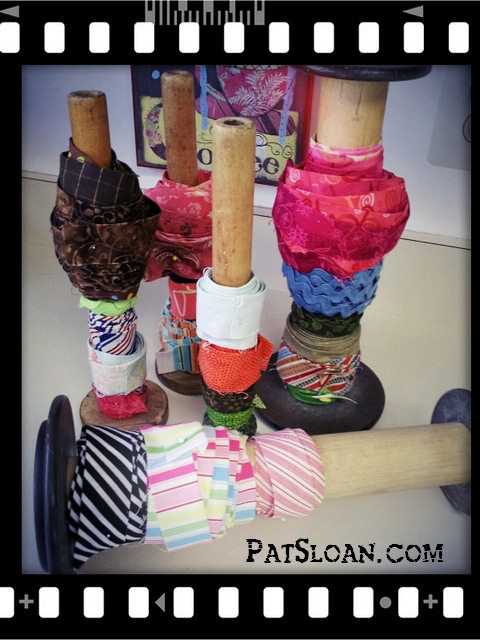 While not really a tool per se, here’s Pat Sloan’s recommendation… pretty and organized! These are wooden spools from textile factories. 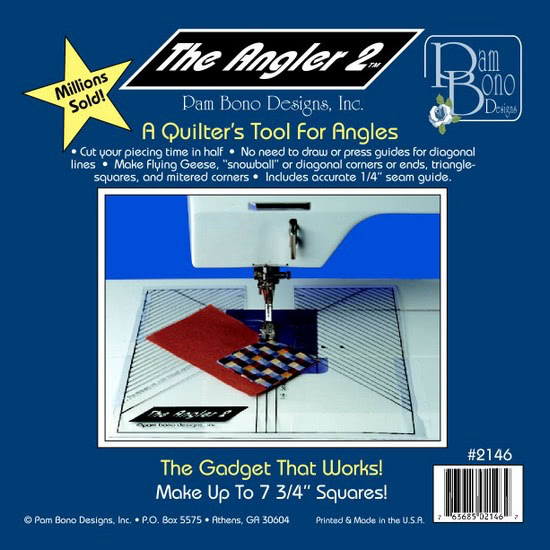 One quilting tool that I feel every beginning quilter should own is the Angler 2 by Pam Bono Designs. I find it very helpful when stitching diagonal lines for half square triangles etc. I have had mine for years and use it all the time. We have two give-aways for the Angler 2 below. My recommended tool is a Stiletto. It helps keep your seams accurate when your fingers can’t do it for you. 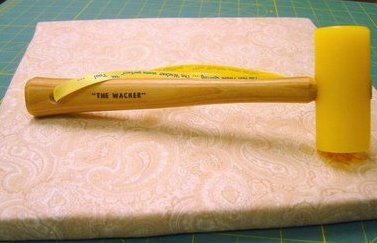 and the Wacker Seams Perfect. You can find this at most quilting shops. I just listed this particular site so you can see it. The Kwik Klip is one of my favourite gadgets. I use it to open and close the curved safety pins I use for basting. If you are still opening and closing by fingers only, you have to try this out. So much less stress on the little muscles in your fingers and hands. Made a huge difference for me. Michele’s note: While I rarely pin baste anymore, I do love this tool too when I do. 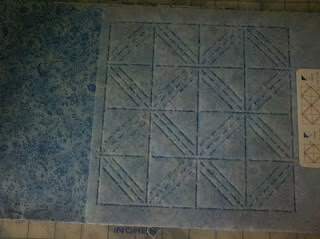 Does a stencil count as a quilting tool? I’m saying yes because this stencil helps make perfect HST (Half Square Triangles) patches. 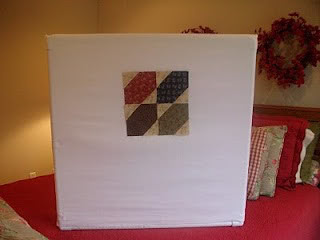 Visit Kitty’s blog to see the tool in action and Sunday Best Quiltworks for photo tutorials and a video. We have a give-away for a set of four stencils below. I have been a quilter for over 30 years. And all this time I have struggled with 1/4 inch seams. I have even purchased the 1/4″ foot for my last two sewing machines. My seams were just too large and I would never get that “scant” 1/4″ seam that many patterns call for. My finished blocks would never be the size the pattern said they should be! 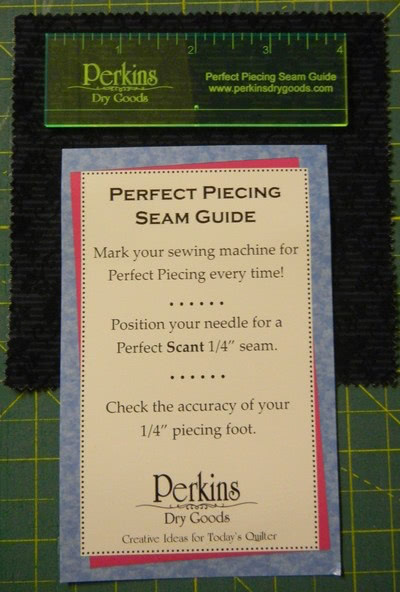 And then last month, I headed away on vacation and came home with a Perfect Piecing Seam Guide. This little guide is phenomenal and immediately corrected my piecing problems. I blogged about too. I can’t live without my Gypsy Gripper. I have arthritis in my wrists and it really saves me a lot of pain when cutting with a rotary blade and holds the ruler steady. Also got to have my Machingers Quilting Gloves for free-motion quilting. Helps again with the arthritis pain but grips that fabric and moves it along so much more easily. Michele’s note: I love these gloves too; they’ve made a huge difference to my free motion quilting. We have a give-away for two pairs below. I love my Clover chaco liner. The white one always brushes off of fabric easily and it’s so much easier to use, in my opinion, than a marking pencil or marker. It glides right over the fabric. One more thing that is absolutely worth the $199 purchase price in amount of back pain saved — the GROLAND kitchen island from IKEA. 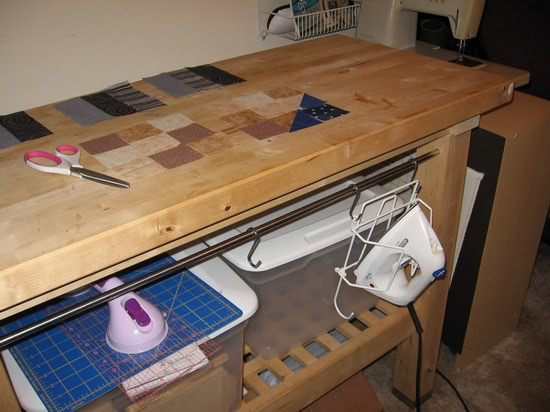 What is a kitchen island good for in the quilting world?? It is the perfect height for a cutting table so that I’m not bending over to cut but standing upright. Not too tall, not too short. Just perfect. It’s made of unfinished birch which gives it a nice crafty feel, in my opinion, and it has a sturdy shelf and hanging rails. Totally amazing. 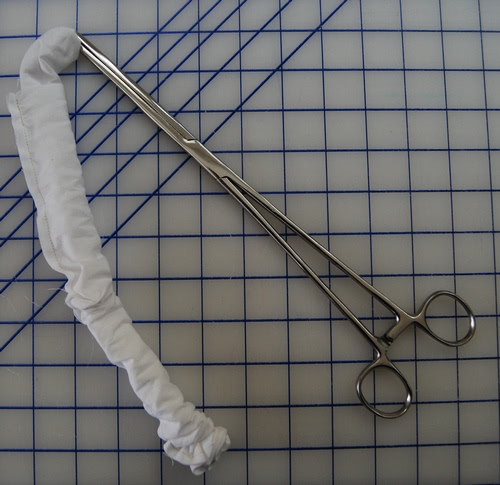 My first suggestion would be a hemostat – can’t tell you how many tubes I have had to turn for various reasons over the years and since buying a hemostat on amazon last year I am in love! It is a snap and good for lots of other uses too if you get inventive with it. You can get them in lots of different sizes – which is useful depending on how long the tube is you are trying to turn. I prefer this to a lot of other tools because you pinch the fabric instead of hooking it which can lead to snags. Michele’s note: I need one of these! 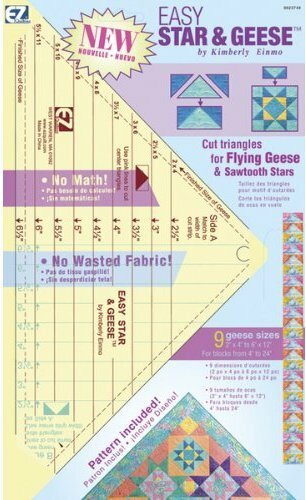 My second suggestion is still my all time favorite tool – the Easy Star and Geese Ruler. I use it ALL THE TIME! 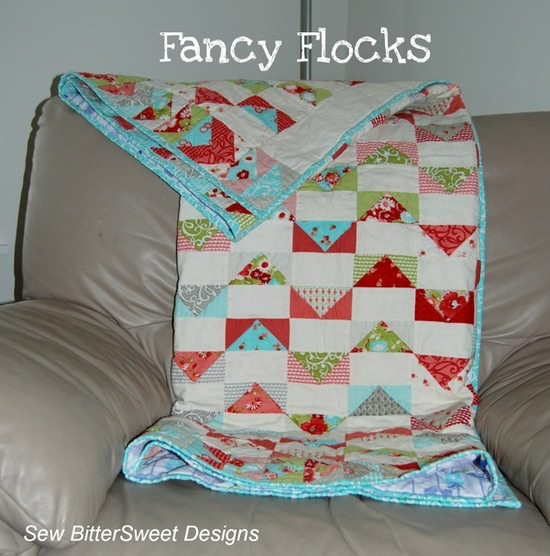 Here’s my Fancy Flocks quilt I made with it and a link to a tutorial I did too. Michele’s note: I love this ruler too! 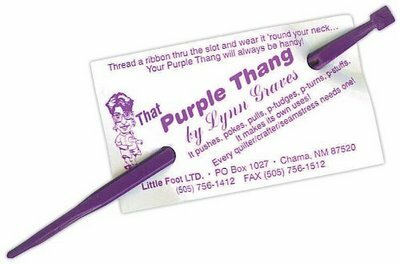 Oh yeah, and let’s not forget the ever useful Purple Thang! Karen from Sew Many Ways has a really fun series on her blog: Tool Time Tuesday. Her ideas are both clever and creative and I often ask myself “Why didn’t I think of that?”. I asked Karen to share a few of the most popular DIY tools that she’s featured on her site. Hi, my name is Karen from the blog Sew Many Ways. I want to thank Michele for inviting me to join in on the fun. She asked me to share a few posts I’ve done on my favorite quilting tools…beyond the basics. I thought the best things to share for sewing and quilting are design walls, pincushions and thread holders. I’ve done several different kinds of design walls over the past few years. Click HERE to the post that has all the tutorials for the ones I’ve made so far. Below is a picture of one that is made with pvc pipes and it’s portable too! Pincushions are another essential in my sewing room. I love them and they are easy to make. 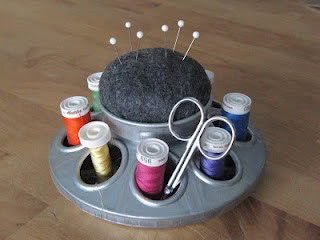 Click HERE for the link to all the pincushion posts…they’re not your usual pincushions! Below is one of many to make for yourself…it’s from a chicken feeder!! Thread holders for hand sewing are a must too. This post was one of my first when I started blogging over 3 years ago. Easy to make and inexpensive too. A necklace thread holder! Click HERE for that post. Thank you again for letting me participate in such a fun project and thanks for stopping by my blog too. There are lots of other helpful tips and hints, so feel free to browse around! 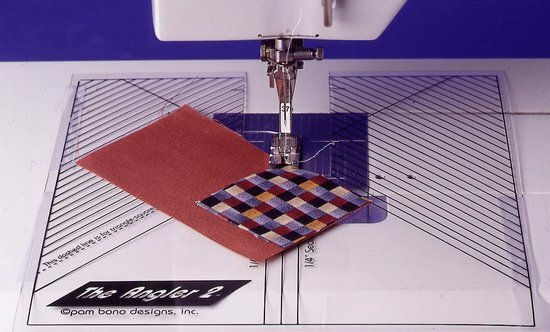 The Angler 2 is a plastic quilting template that fits every sewing machine. It can be installed and reinstalled in minutes with a few pieces of painter’s tape. Make up to 7 3/4″ squares. It eliminates the necessity of drawing or pressing diagonal seam guide lines and is very accurate for chain piecing. After a bit of practice, it cuts piecing time in half! See the demonstration videos on our site. I have two Angler 2 templates to give away. 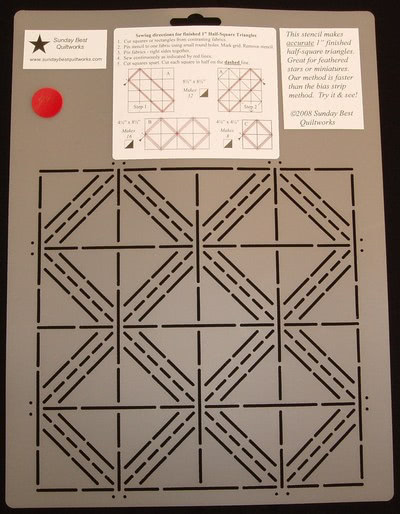 Half-Square Triangle Stencil – No more cutting and marking squares! You can make 32 perfect half-square triangles in 15-20 minutes. Just pin, mark, sew, press and cut. Minimal waste of fabric and no paper to remove! See our demo on YouTube. The give-away is a set of 4 stencils: 1″, 1-1/2″, 2″, and 2-1/2″ finished sizes. 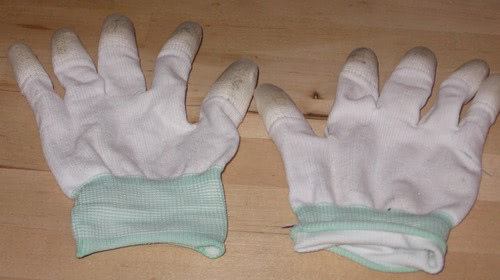 Machingers Quilting Gloves are specifically designed for machine quilters. They are lightweight and form-fitting. The have fully coated fingertips for excellent grip with less resistance and drag on fabric. No coating on palm allows skin to breathe in cool comfort. They are made of nylon knit. I have two pairs to give away. Leave a comment below sharing your favourite Not So Basic quilting tool. Include a link to the tool if you can find one. Additionally, indicate which of the three tools being given away above that you would love to win. One comment/entry per person. Winners will be randomly selected next Wednesday, April 11th 2012. Thanks to the sponsors for the lovely prizes. Winners, check your inboxes for a message from me. 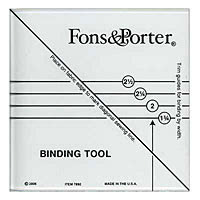 I recommend the “perfect binding miter” by Glenna. Using this tool has really improved the corners of my bindings. What I couldn’t do without is my computer. I can design with it, research a quilt I am working on, find free patterns, tips and a whole lot more. I would like to win the Angler2. I love all the suggestions, I adore my Machingers gloves and painter’s tape is always close by! I’d love to win the stencils, what a wonderful product! I don’t have a huge collection of tools – mainly basics like the rotary blade and cutting mat etc. Couldn’t live without either of those. The Angler 2 would be really useful to me. I also love basting spray. I have used the Dritz spray and it is colorless, orderless and works. I’d love to win the Machingers gloves. Thanks for the chance to win! One of my not so traditional quilting tools is a tweesers. 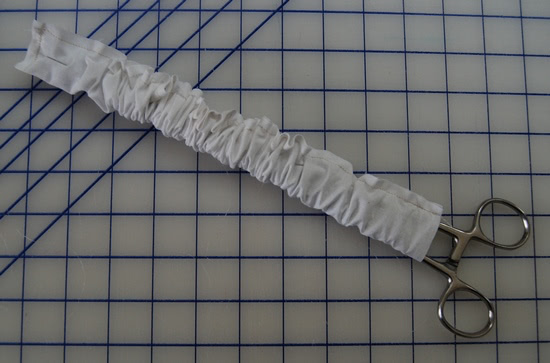 I use one to grab the short tails of thread when I thread a needle or when I am FMQ and need to pull the bobbin thread to the top of the quilt. My favorite item to win would be the Angler 2. My favorite tool is the Frixion pen. You can write in fabric and iron the marks away. My second favorite are the plastic containers salad greens come in. I use them to organize projects, so I don’t “borrow” fabric from a project before u get to work on them. I would love the stencils, they look like a fun way to make half square triangles. I’ d like to win Angler 2 . Thanks for doing this nice give away ! I’m a bit new to quilting, but I love my rotary cutter and mat and I also have a large refrigerator magnet stuck on my sewing machine to catch pins when I’m sewing. Can’t tell you how many times I used to end up with them in my feet because they’d roll off the table when I was busy sewing. Now I just stick them on the magnet as I sew. I love my Chocoliner (mentioned above). I have them in many colors. Note: red doesnt always erase all the way, so be careful. The new rulers look sew cool! I would love to win. I would love the Sunday Best’s Original Half-Square Triangle Stencil. Thanks for doing this. I love my shape up ruler. I don’t know where I’d be without it. It makes cutting strips so fast. It can also do other angle cuts. The tools I use the most are my rulers and cutting mats. I would love the have the Angler 2. Bamboo skewers. They are a great stiletto (I have never seen the pink one here) and just crack, not shatter, if hit by the machine needle. I have never used anything on the give-aways, so whatever! I love several of the tools already mentioned. Another I find very useful is the Olfa circle cutter, which works well. And for paper piecing, the add -a -quarter ruler is a must. I have been wanting an Angler for a while so appreciate the review and the giveaway! I love my Quilt In A Day Triangle Square Up Rulers. Fast and Easy Way to make multiple HSTs. I would Love to win The Angler 2. I so need the Angler. I dread triangles because I can never, ever get them accurate. So frustrating! I love this post! I know about some of these tools, but learned so much more. Gotta admit, I’ve been using a hemostat for years. But what I’d like to share is so super simple…..use an old refrigerator magnet to hold and attract pins. Especially good when you get a pin stuck where your fingers don’t fit, also good to pass over a finished product to look for stragglers. I would love to win the machingers quilting gloves. The lint roller is something I can’t live without. I use it everytime I am in my workspace to clean up stray threads. Lots of my favorites have been mentioned already — and a few have been listed that I didn’t realize how badly I needed them until just now!! I really like my magnetized pin holders (something like this: http://www.nancysnotions.com/product/blue+magnetic+pin+catcher.do ) I have several — one I keep near the machine to keep pins as I pull them (while I sew), one at my ironing board, and one for binding clips as I pull them off when stitching on my binding. Plus, if I ever have a ‘whoops’ moment and drop my pins on the floor, a quick sweep of my magnetized pin holder and it’s no problem! Oops My trigger finger triggered before I had a chance to say that I would like to win the Angler 2. It would be nice not to have to draw lines! Love my rotary cutter most. Really liking the June Taylor shape cutter! Love the ideas and have a lot of these tools. Cool idea on the pincushion from the chicken feeder. The HST stencil looks great, quick to mark just a few HSTs to stitch. Thanks for the inspiration! I use my dining room table to pin baste most of my larger projects, but found that I was digging into the finish with the pins. I fixed this by using a plastic cutting mat that one would normally use for cutting vegetables. It’s fairly large and slides really easily under my project as I pin from one section to the next. I would love to win the Angler 2, that’s a tool I have yet to try, but I know I could put to good use! I couldn’t do quilts without my sewing machine, rotary cutter and mat, or the computer for the classes that I am taking. Lets not forget the fabric store!! Love it when they have a 1/2 price day ~ thats when I buy my fancy rulers! I love my hemostat thingy oh so useful. I just got it recently as a gift from a friend and I don’t know what I ever done with out it. I also love my curved embroidery scissors for trimming threads while quilting and hand sewing. Now I NEED the June Taylor shape cut and the Easy star and geese. My favorite tool is the Wing Clipper. It is a ruler that lets you make the flying geese larger and then you trim it down to the exact size. I’m interested in the half square triangle stencil. Thanks for all of the great tools you have shown. My favorite is my rotary cutter. I love to use my thread cutter when I chain piece things. I can sew a long chain of pieces and then just use the thread cutter (hand held by the way) to just cut the threads between the pieces. I don’t have to worry about cutting the fabric and it goes so quick! I would like to have the angler 2. It looks great! One of go-to and fav tools is my little wooden pointed tool to push those corners to perfect points. I do a lot of sandwiching with my table runners and wallhangings. It also gets the sides of the quilts pushed out and made just perfect. I have no idea what this tool is called, but I couldn’t live without it!! I would really love to win the Angler 2. It looks like it would be a great addition in my quilt room! Thank you. 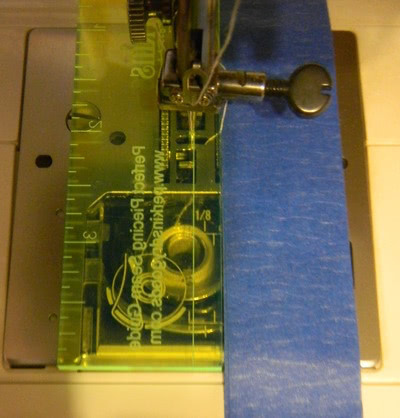 I love using a 17×3 ruler and a 5×5 square ruler and my rotary cutter and mat. I am new to quilting and enjoy learning how to make different patterns and techniques. would be an amasing help. Hi, I have just discovered this website and it is so useful. Thank you. I was recently given a fantastic tool for trimming down accurate flying geese patches. It’s called ‘Deb Tucker’s Wing Clipper’ here’s a link to it. I adore flying geese blocks and this allows them to match up beautifully! I would love to win the Angler 2. thank you. It’s marked for 1/4″, 1/2″ and 3/8″ binding widths and makes beautiful mitred corners on all my quilt bindings. It’s also only about 1 1/2″ square in size, so it’s very easy to use and manoeuvre under the machine foot. I loved the pincusion with the cups around the circle! I would be lost without my seam ripper and that purple thang. Love these items. Would love to get the Angler ruler if I win. Thanks. My favorite new tool is a pen I found that erases when it is ironed. I am so excited by it! It is called Frixon. Originally made for business but us quilters found out that it works so well for us. It is good for embroidery or marking for quilting. I’d take the Angler 2 or the Half Square Triangle stencil. I’d love to win the Angler 2! 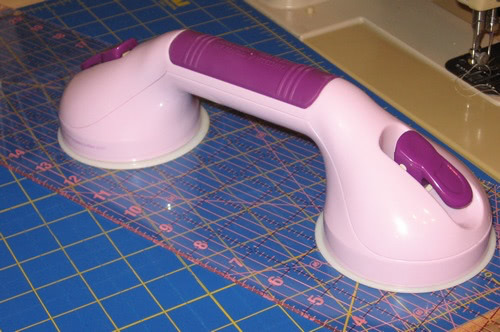 My favorite tool is my rectangular ironing board topper. Makes ironing yardage and pieced tops a lot easier. The fabric hangs evenly, instead of at an angle like off the front of a standard ironing board. Thanks for the chance to win a new gadget. Love my gadgets! Most useful tool is unfortunately a good seam ripper. Love to have the angler 2! I don’t think there are many quilting tools more important than a good seam ripper. 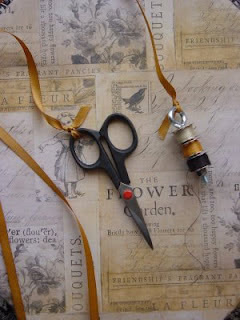 However, I love a good small scissor and have two at different spots in my sewing studio. One by the sewing machine and one by the cutting station. I love my big ironing surface too. Copyright © 2019 Quilting Gallery. Powered by WordPress. Theme: Spacious by ThemeGrill.